Acclaimed actress Shirley MacLaine and four musicians spanning rock, jazz and opera - Billy Joel, Carlos Santana, Herbie Hancock and Martina Arroyo - will receive this year's Kennedy Center Honors, considered the nation's highest honor for those who influence American culture through the arts. The honorees were announced Thursday. In December, President Barack Obama will host the recipients at the White House, and Secretary of State John Kerry will host a dinner for them at the State Department. Top entertainers will salute the honorees in a gala performance Dec. 8 to be broadcast Dec. 29 on CBS. In an interview, Santana said he was very grateful and happy to be in the company of luminaries and to receive an award he remembers watching almost every year with his family. The 66-year-old musician who was born in a small, remote town in Mexico and immigrated with his family to San Francisco said he set out to bridge cultures and music styles. As a Mexican immigrant, Santana is unique among those who have received the cultural prize. Last year, the National Hispanic Foundation for the Arts complained the Kennedy Center had long excluded Latinos. Of the more than 180 past honorees, only two have been Hispanic, the group said. The criticism led to a revised selection process this year, including the solicitation of nominations from the public, and a new committee of artists and officials helped narrow the potential honorees. Santana, who swept the 2000 Grammy Awards in nine categories with his album "Supernatural,'' said more mainstream institutions should be recognizing Latino artists. "Piano Man'' Billy Joel, one of the best-selling recording artists of all time, said he was honored to be named a Kennedy Center honoree. Joel, the pianist, singer and songwriter behind numerous unforgettable hits, including "Uptown Girl,'' "Allentown'' and "We Didn't Start the Fire,'' has devoted his life to music. In a written statement, he said he was honored to join the roster of outstanding musicians who came before. "But to be chosen for this special award essentially for doing what I love most amazes me more than anything,'' he said. For MacLaine, the honors almost feel like a homecoming, she said. The 79-year-old actress grew up in nearby Arlington, Va., and attended ballet lessons almost every day from the time she was 10 in nearby Georgetown. She said she has played her cello at the Kennedy Center in the past. The cultural prize, though, stands apart from other awards, she said. After nearly 60 years as one of Hollywood's leading actresses, MacLaine hasn't stopped. She began this year with a role in the popular "Downton Abbey'' on PBS and will close the year with her latest film, "The Secret Life of Walter Mitty,'' alongside Ben Stiller and Kristen Wiig. Hancock, born in Chicago, became a classical music prodigy after his parents bought him a piano as a boy, and he played with the Chicago Symphony by the age of 11. In high school, he discovered jazz, however, and began learning by listening. In 1963, Hancock joined the Miles Davis Quintet, one of the great jazz ensembles. He has gone on to embrace electronic music and to collaborate with the likes of Annie Lennox, John Mayer, Christina Aguilera and others. Arroyo, born and raised in Harlem as the daughter of a Puerto Rican father and an African-American mother, said her voice was discovered by accident in high school when she was heard imitating the singers outside an opera workshop. She went on to star in the great opera houses in Paris, London, Vienna and beyond. Arroyo made her debut at Carnegie Hall in 1958 and had her breakthrough with the Metropolitan Opera when she was called at the last minute to replace Birgit Nilsson in "Aida'' in 1965. She went on to perform 199 times at the Metropolitan Opera, performing all the major Verdi roles, as well as roles from Mozart, Puccini and others. Still, Arroyo, 76, said she is most proud of her work teaching young students about character study in opera. 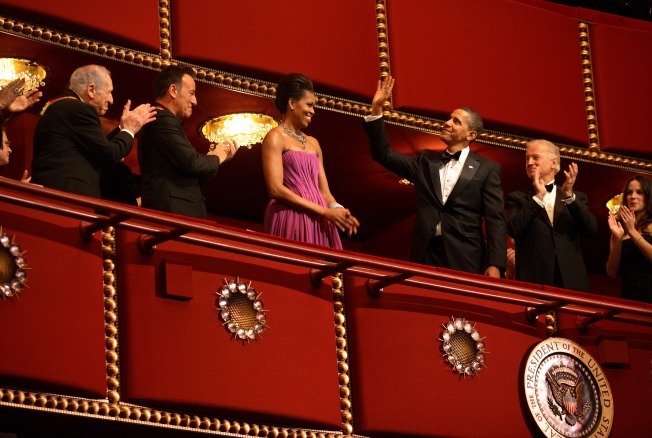 Receiving the Kennedy Center Honors, she said, was unimaginable.